We let you know when air pollution levels are high in Central Ohio and how to protect your health and your loved ones. We also work to make the air in Central Ohio safer to breathe through education and by working with local governments and businesses to reduce health-impacting emissions. Get daily air quality information and protect your health. Click here to get Air Quality Alerts or forecasts by email or text. Or call the air quality hotline for information in English or Spanish at 1.888.666.1009. MORPC uses the Air Quality Index (AQI) to report daily forecasts and Air Quality Alerts. The AQI tracks pollution levels in the air and tells us if the air is healthy to breathe. 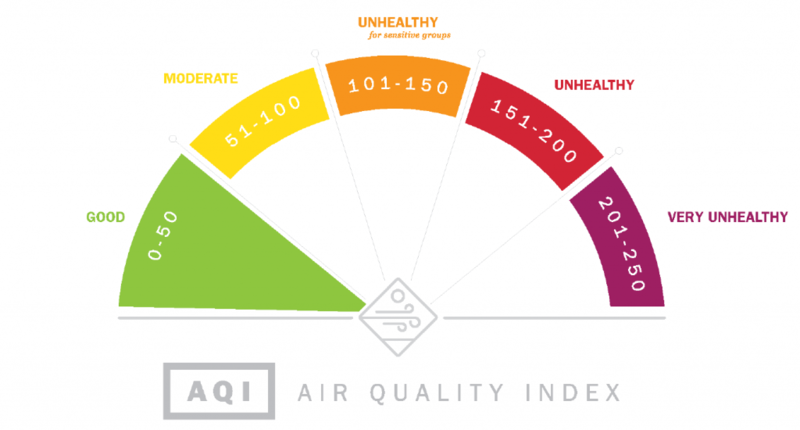 On most days, air quality is in the green or yellow range—good days to be active outside. But on several days each year, ozone and fine particle pollution can reach unhealthy levels, pushing AQI levels into the orange range—unhealthy for sensitive groups. In Central Ohio overall, air quality is improving thanks to local and national initiatives to reduce emissions. The number of good AQI days has been increasing over time while the number of moderate and higher days has been decreasing. The number of unhealthy for sensitive groups and unhealthy days varies from year-to-year due to differences in weather conditions and events like wildfires. The Mid-Ohio Regional Planning Commission issues daily forecasts and Air Quality Alerts to keep the public informed of local air pollution levels. MORPC uses the Air Quality Index to report pollution levels. The higher the AQI level, the greater the health concern. When air pollution is expected to reach 101 AQI or above, MORPC will issue an Air Quality Alert for Central Ohio. Sign up for Air Quality Alerts here. We monitor and send out forecasts and alerts for ground level ozone pollution levels from March through October. Ground-level ozone pollution is created when emissions from sources such as cars, industry and lawn equipment react chemically in the presence of sunshine. Concentrations of ground-level ozone peak when temperatures are warm, it’s sunny, and winds are light. Ozone is the main ingredient of smog. Learn more about ozone pollution. Learn more about health impacts from ozone pollution. The Mid-Ohio Regional Planning Commission monitors and sends out forecasts and alerts for particle pollution levels year round. Fine particle pollution (PM2.5) is made of microscopically small solid or liquid particles. Some sources of these fine particles are diesel trucks, buses, power plants, and wood burning fireplaces. Concentrations of PM2.5 often peak during overnight hours when cool air is trapped near the ground and pollution levels build in that layer of air. Particle pollution can also be transported into central Ohio over large distances, such as from distant wildfires, if weather conditions are right. Learn more about particle pollution. Learn more about health impacts from particle pollution. Join businesses, local governments and other Central Ohioans in taking clean air actions. Driving less is better for public health and the economic well-being of Central Ohio. Cars and trucks on our roadways are a dominant source of air pollution. They create almost half of emissions that produce ozone and particle pollution–two health-impacting pollutants that MORPC tracks. And Central Ohio has some of the highest rates of people commuting alone to work in the Midwest. Make your operations more economic and sustainable by going Idle Free. We provide free support services to local businesses and governments interested in adopting an Idle Free policy. This includes sample Idle Free policies, support from MORPC staff in tailoring a policy to your needs, materials to distribute to employees, and free parking lot signs for any government adopting an Idle Free policy. Contact Brooke White or call at 614-233-4168 for further information.